As an ESRI Development Center, Z_GIS every year has the opportunity to nominate one top student based on his or her software development competence. 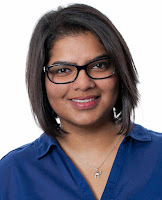 This year this special honour is awarded to Azmat Arif for work leading to her University of Salzburg "Applied Geoinformatics" MSc Thesis "Deriving Hospital Catchment Areas from Mobile Phone Data" supervised by Dr Bernd Resch. A brief abstract describing Azmat's work: delineating catchment areas of medical facilities is essential for estimating the quality of a health-care system and to maximise the efficiency of health service provision. One critical shortcoming of previous approaches is manifested in comprehensive assumptions about a hospital’s patients by using census data or gravity models. In contrast, this approach uses anonymised mobile and landline phone data to derive hospital catchment areas. The overall goal is not to assess the quality of the health care system, but to identify the geographic areas from which people actually communicate with, and thus likely use a hospital. Thus, results from this research reveal new insights into the de facto catchment areas of hospitals by minimising assumptions about demographic factors. (d) Sangre Grande General Hospital. 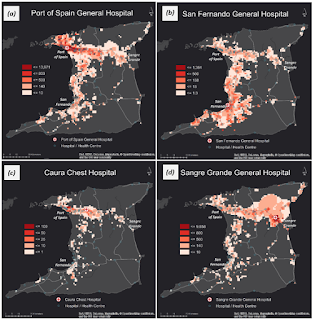 The approach proposed in this research uses anonymised mobile and landline phone data to delineate hospital catchment areas. 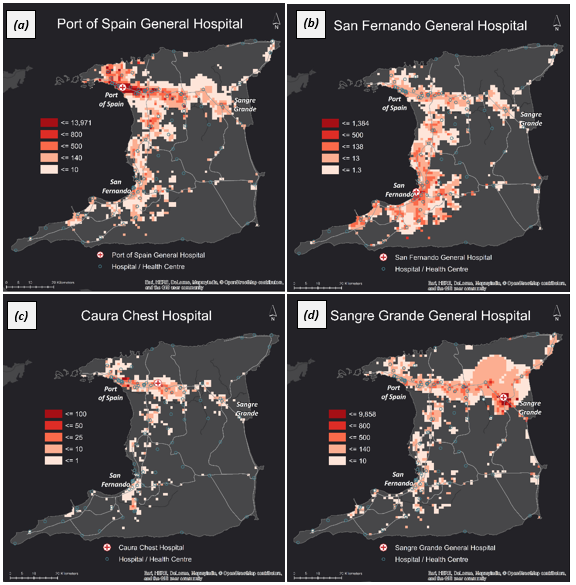 The aim is to identify the geographic areas, in which people use a hospital instead of assessing the quality of the health care system per se. Therefore, we analyse calls to and from hospitals in Trinidad and Tobago. This goes beyond just using patient records in that we are able to draw conclusions from a wider range of communication with a hospital (enquiries, arrangement of appointments, follow-up care, visitors, etc. ), beyond patients’ hospital stays. In performing this research, a number of limitations are identified. First, not all calls made or received within a hospital are necessarily related to the hospital’s “business”, which induces an un-known bias. Moreover, it is not accounted for the mobile cells’ spatial density in this analysis. Thus, the current method does not consider the probability of a cell phone connected to a particular antenna decreaseing if many cells’ coverage areas overlap. Furthermore, the use of grid cells in the calculation of the catchment areas may lead to a modifiable areal unit problem (MAUP). This could potentially be mitigated by intersecting all ellipse segments, which was too computationally intensive given our extensive dataset. Finally, evaluation and validation of our results are difficult as no data for ground-truthing or comparable studies exist. Congratulations to this distinction, and to continuing a tradition of excellence established by previous recipients of this award like Laura Knoth in 2016!